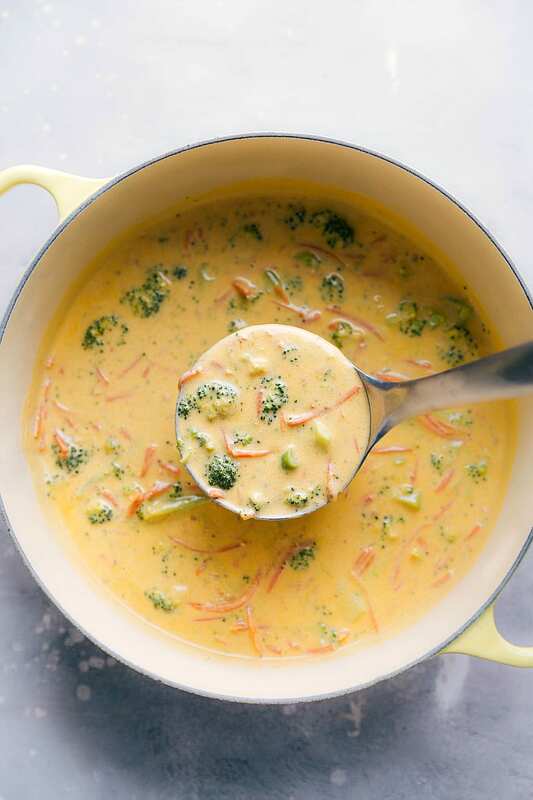 Creamy and delicious broccoli cheddar soup made in ONE POT on the stovetop. This soup is easy to make and full of flavor (the “secret” to this soup is in the spices!). Serve this broccoli cheddar soup recipe with this Italian Salad, Roasted Vegetables, and/or a crusty loaf of bread! Soup is a popular meal choice in our home especially when it’s cold outside. Grey could eat this tomato basil soup every meal of the day if I let him and Bentley inhales this creamy vegetable soup. One of my all-time favorite soups? Cheddar Broccoli! When we lived in Cleveland, we were right next to a Panera Bread, and I always ordered their broccoli cheddar soup. Since there isn’t a Panera near me anymore, I’ve had to create my own broccoli cheddar soup and I’m thrilled with this recipe. I’d say it’s even better PLUS you’ll know exactly what the ingredients are in your soup (which you can’t say the same for Panera’s broccoli cheddar soup). How do you make cheddar broccoli soup? Develop flavor: you’ll start by sautéing an onion and garlic in olive oil + butter. Next, we “bloom” the spices. By gently frying the spices in the oil, you’re deepening the flavor and enhancing the flavor profile of the spice for a brighter taste and smell. Simmer: once the base of the soup is finished, add in the broccoli and carrots and allow them to cook until tender. Add cheese: last step: stir in the cheese. You want to be sure to use a good high quality extra sharp cheddar cheese. 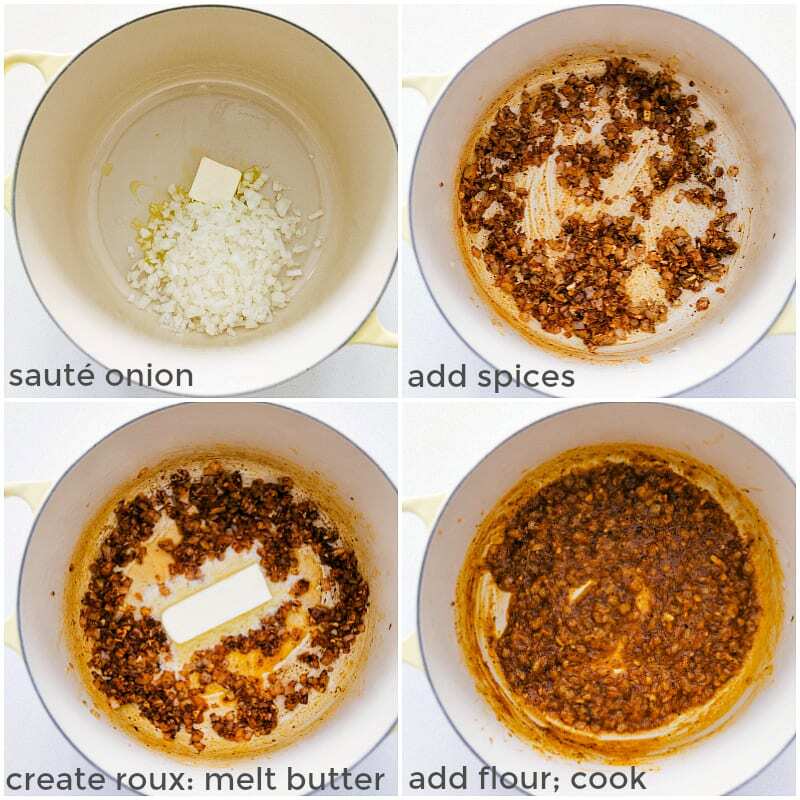 This is crucial to the end flavor and texture of the soup! How do you make easy broccoli soup? 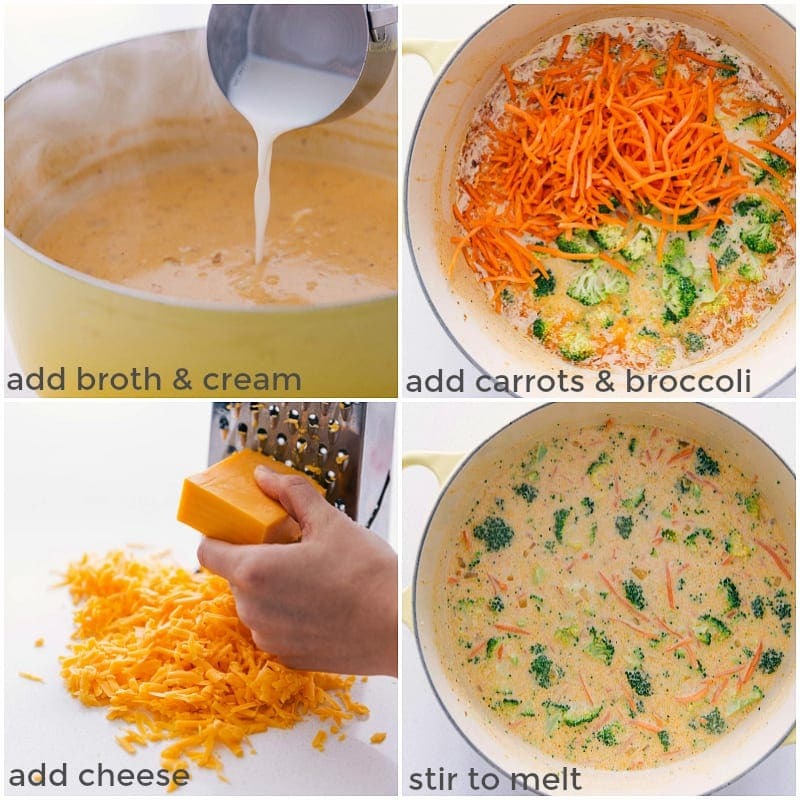 Using shredded carrots: to save prep time, we’re using pre-shredded/grated carrots in this soup! I mentioned earlier that the the secret to this broccoli cheddar soup from scratch is in the spices. 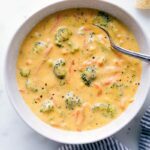 Just a few spices add an incredible depth of flavor and complexity to this soup that you don’t typically get with just adding cheddar to a cheddar broccoli soup. With that said, read on to hear my spice recommendations! What spices should you add to broccoli soup? Salt and Pepper: a given, perhaps, but these shouldn’t be overlooked! Seasoning with salt and pepper is personal to taste preference AND will vary depending on the type of broth/stock you use (some are salted more than others). Dry Mustard: simply ground mustard seeds derived from a mustard plant (which happens to be a vegetable plant related to broccoli plants!). Dry mustard is generally used when adding flavor to vegetables and it’s a perfect pair for the broccoli in this soup. Cayenne Pepper: before you get scared away that this will make the soup spicy, it really doesn’t! It simply contributes to that depth of flavor. Can you freeze this broccoli cheddar soup? This soup actually doesn’t freeze very well because of the dairy in it. If you’re worried about having too much, I’d recommend halving the recipe! How do I reheat this soup? I recommend reheating this soup on the stovetop over low heat, stirring frequently. (Boiling may cause ingredients to separate.) Soup is best within 1-3 days. More info here. Can you make this soup vegetarian? Yes! 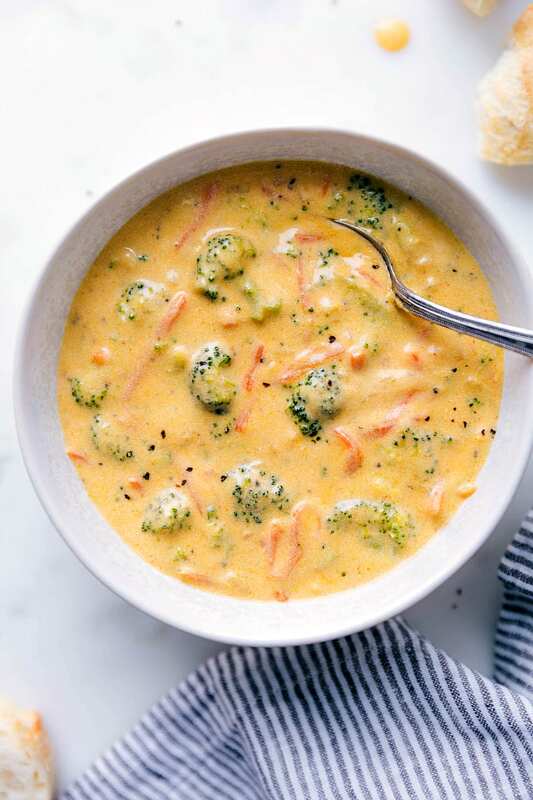 Very easily 🙂 Swap out the chicken stock for vegetable stock (or broth) and you’ll have a vegetarian broccoli cheddar soup! Add 1 tablespoon butter and olive oil to a large heavy bottomed stock pot/dutch oven over medium heat. Add the diced onion and saute, stirring occasionally, until tender, about 3-5 minutes. Add the minced garlic, paprika, mustard, cayenne pepper, and pepper (I add 1 teaspoon, but add to preference) to the pot. 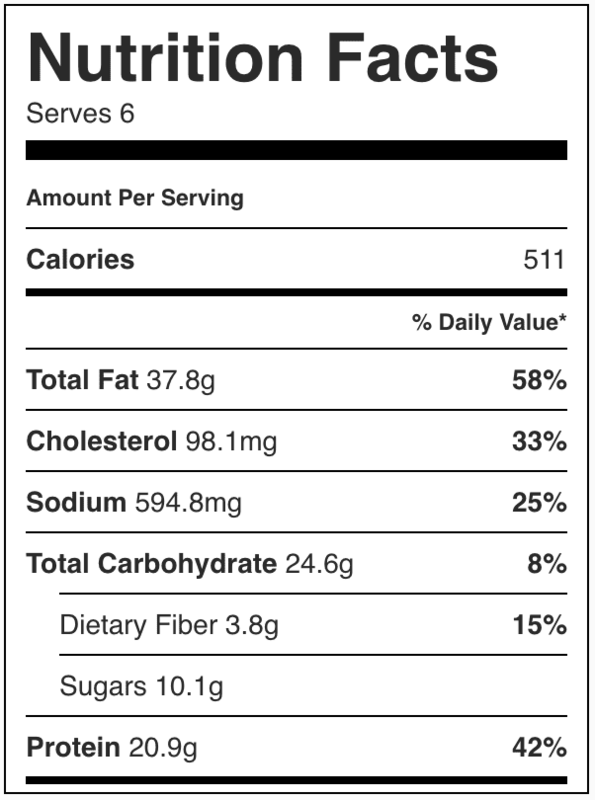 (I like to add the salt AFTER the stock to gauge how much more it needs.) Cook for another 45 seconds to 1 minute stirring constantly until fragrant. Add in remaining 6 tablespoons butter and melt. Once melted, add in the flour and whisk to combine. Cook for 2-4 minutes, whisking constantly, until the flour is thickened (don't rush or your soup won't properly thicken/taste right). Meanwhile, chop the broccoli and shred the cheese. Add the chopped broccoli florets and matchstick/shredded carrots (give carrots a quick chop in half if they are super long) to the soup. Add in the cheese and stir until melted. Again taste for seasoning. Serve immediately in bread bowls or regular bowls with a side of bread for dipping! Made this soup tonight and it was delicious. Very tasty! I had a question and another was my mishap. I wanted to ask you how much flour you add as it was not in the recipe, or I missed it? The other issue I had is there was some curdling in the soup along the way. The taste was still very good but I was not sure if it was shocking the soup with the cold half and half might have caused it or I did, unfortunately, let it get to a boil. What might you think caused it to happen as I do want to make it again, without the curdles ;-). Thanks for a delicious soup. This is delicious! I need to double the recipe sometime! I used heavy whipping cream, left out the carrots, and roasted the frozen broccoli with olive oil sprayed on top for 25 min. on 400 degrees before adding it to the soup (because I didn’t have fresh broccoli). I paired it with toasted sourdough bread with Kerrygold butter on top…ahhhmazing…thank you for sharing this recipe with everyone! Oh, and I added bits of chicken! I live in the mountains in Japan so this soup is not available anywhere. This soup was so delicious and just what I was looking for. My family came in from work/school and the cheese had barely melted before they started eating and they loved it. Thank you for this recipe. Will definitely be making it again and again.